What is the Best Promo Code or Bonus for FanDuel? What is the Best Promo Code or Bonus for DraftKings? What Are The Differences Between Regular Fantasy and Daily Fantasy Sports? Is DraftKings legal? Is FanDuel legal? What Should I Do Before Signing Up? How Do Bonuses Work on FanDuel and DraftKings? 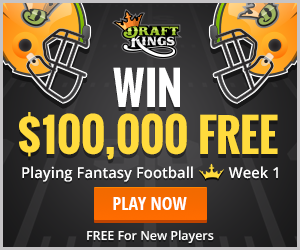 Can You Win Money on DraftKings? Can You Win Money on FanDuel? Is DraftKings Legit? Is FanDuel Legit? Is DraftKings Rigged? Is FanDuel Rigged? How Much Can You Win on FanDuel and DraftKings? Is It Easy To Deposit and Cash Out? – What is the Best Promo Code or Bonus for FanDuel? The best promo code or bonus code for FanDuel is GET200 which will gets you the absolute best available bonus which is 100% of your deposit matched up to $200. Although the bonus is up to $200, you will only receive the bonus on the amount you deposited. For example, a $100 deposit will receive a $100 bonus, a $200 bonus will receive the full $200 bonus, a $750 deposit still only gets you a $200 bonus. Please note that any bonus you receive on FanDuel will first appear in your account as “pending bonus” that is separate from your cash balance. That means you can’t immediately cash out or play with your bonus. Rather, as you play and the more you play, your pending bonus dollars are then converted into cash which you can then use to enter any tournament or just cash out. Although the commercials and other advertising for Daily Fantasy sports do not necessarily make this clear, we want this to be clear to you before depositing and feeling mislead. We feel strongly about any new sign-ups being informed about this before depositing any of their own money. If you still have any questions about how this works, feel free to contact us. – What is the Best Promo Code or Bonus for DraftKings? The best promotion for Draftkings is to receive free entry into a paid tournament. – What Are The Differences Between Regular Fantasy and Daily Fantasy Sports? Instead of joining a league and playing for an entire season as with traditional fantasy, DFS takes place over the course of only one day, or in the case of football, several days. You simply register for a tournament based on the buy-in you select, draft a new team instantly and get ready to face off against everyone else who joined. If your team does well you can win huge prizes that are paid out instantly as soon as the last game that day is completed. You can do it all over again the next day with an entirely new team. If you don’t want to play the next day, that’s fine too. There’s no commitment beyond that one contest in Daily Fantasy sports. DFS allows you to decide when you want to play and when you want to sit out – no need to maintain a lineup each and every day as with traditional season-long fantasy. Instead of having to wait an entire season to see if you win money, you just watch your team go for one day. Daily Fantasy sports takes everything you love about season-long Fantasy and condenses it down into one day, or if it’s football, several days. – Is DraftKings legal? Is FanDuel legal? “Fantasy Sports is considered a game of skill and received a specific exemption from the 2006 Unlawful Internet Gambling Enforcement Act (UIGEA). FanDuel uses exactly same rules as season long fantasy sports game, the only difference is that our games last only a day. Thanks to fantasy sports being specifically excluded from laws affecting online sports betting, FanDuel is not illegal in any way. – What Sites Should I Join? With the popularity of Daily Fantasy Sports increasing, there are an increasing number of sites available to play on. We’ve found at this point that there are only two sites we feel comfortable recommending as top sites that you should play on: FanDuel and DraftKings. We believe their prize pool sizes, player numbers, ease of use and trustworthiness are all well above the next tier of sites. When it comes to selecting between these two sites, they are both excellent and beyond reading our site reviews, it really is personal preference as to which site fits exactly what you want. It wouldn’t hurt to play a bit at each site to decide which site – or if it’s both sites – that you enjoy playing on best. – What Should I Do Before Signing Up? Before signing up, make sure you check out our Bonus page to make sure you receive the top bonus for the site you are planning to sign up for. If you don’t know which site is best or which one to sign up for, check out our unbiased reviews. If you are completely new, take a few minutes to read through the rest of the FAQ or read our quick into to Daily Fantasy Sports so you know what you are signing up for. As always, you can feel free to contact us if you have any other questions or if you need any help getting started in Daily Fantasy sports. – How Do Bonuses Work on FanDuel and DraftKings? Bonuses are awarded as based on a 100% match of your initial deposit. On FanDuel you would receive the 100% match up to $200. For example, a $100 deposit will receive a $100 bonus, a $200 bonus will receive the full $200 bonus, a $750 deposit still only gets you a $200 bonus. Please note that any bonus you receive will first appear in your account as “pending bonus” that is separate from your cash balance. That means you can’t immediately cash out or play with your bonus. Rather, as you play and the more you play, your pending bonus dollars are then converted into cash which you can then use to enter any tournament or just cash out. Although the commercials and other advertising for Daily Fantasy sports do not necessarily make this clear, we want this to be clear to you before depositing and feeling mislead. We feel strongly about any new sign-ups being informed about this before depositing any of their own money. If you still have any questions about how this works, feel free to contact us. – What Are the Different Types of Contests? These are the biggest tournaments in Daily Fantasy, with prize pools now up to several million dollars. These are tournaments with a lot of players – sometimes 10’s of thousands – where you can enter a team and track yourself on the leader board the whole time to see how you’re doing against all the other teams. These guaranteed prize pool contests, sometimes referred to as “GPPs” for short, will offer their advertised prize pool no matter how many people enter. It will sometimes happen that there aren’t enough entries to make up the guaranteed prize pool amount, but in that case it’s up to the site to kick in the difference and all the players benefit. For example, a $20 buy-in GPP with a $100,000 prize pool would need 5,000 players to reach the guarantee. If only 4,000 players enter, the site has to put up the missing $20,000 and all the players still play for $100k. GPPs are great for providing huge pay outs for very little risk, as often with so many players entering the entry fee can be quite low and still pay out a ton of money. Generally in GPPs roughly 15-20% of the field is paid. For example, in a 100,000 person GPP, about 15-20,000 players will make money, with prizes increasing the closer you get to first place. These are one-on-one winner-takes-all tournaments. Tournaments with any number of players in which the top-half of finishers win an equal prize and the bottom half receives nothing. Satellites or qualifier tournaments are smaller buy-in tournaments that allow you to win entry into larger high-stakes tournaments. You can also win entry into live championship tournaments that take place in places such as Las Vegas or Atlantis. These tournaments also sometimes offer prizes not tied to Daily Fantasy Sports such as a seat in a World Series of Poker or Word Poker Tour event, or a VIP experience at a major sporting event. Leagues are smaller versions of the Larger Guaranteed Prize Pool tournaments (GPPs) described above. Leagues usually have no more than 20 players. These tournaments are for those looking for a quick boost in their bankroll. Winning entries all receive 3x all the way up to 20x of their buy-in in winnings, depending on which booster you enter. Contests that are free to enter but still reward cash or other prizes. Steps tournaments begin at Step 1 and winners proceed up to a higher Step such as Step 4. Each time you place high enough in a lower step you receive entry into a higher step. Once you’ve reached step 4 or the highest step, you can win huge cash prizes that are way bigger than you normally could win with your original step 1 buy-in. – Can You Win Money on DraftKings? Can You Win Money on FanDuel? YES! While you might not win money in the first tournaments you play, as you get used to drafting a Daily Fantasy team and study up on some strategies and lineup picks for that day, you will likely find more and more success. There are people making ten’s of thousands from Daily Fantasy each year. There’s nothing stopping you from doing some research and becoming a big winner yourself. – Is DraftKings Legit? Is FanDuel Legit? Yes! Both DraftKings and Fanduel are legit, legal and safe. These are the two most trusted sites in Daily Fantasy and for good reason. They both provide huge tournaments with instant payouts as soon as all games from that day are complete. In addition, both have well over $50 Million in private funding and keep user funds separate from any operating expenses. – Which site is better DraftKings or FanDuel? We play on and recommend both sites. They are both great sites and it may be best to play a little bit at both to get the maximum bonus and to take advantage of both of their promotions. If you need to decide on one, check out our unbiased reviews of DraftKings and FanDuel. – Is DraftKings Rigged? Is FanDuel Rigged? No – FanDuel and DraftKings are not rigged and are not scams in any way. The sites themselves do little more than collect the buy-ins and run and track the tournaments, much like any of the season-long fantasy sites you are used to. These sites are trustworthy and safe and pay out all winnings to players as soon as they contest is complete. The sites don’t have any entries of their own in the contests and all contests are closed to any further entries once the tournament begins. – How Much Can You Win on FanDuel and DraftKings? There’s ton’s of money to be made on FanDuel and DraftKings. Each NFL Sunday on DraftKings has a $1 Million dollar winner in their top contest. FanDuel has about $500,000 to 1st in their Sunday Million NFL tournament. Other sports also have huge tournaments each week offering 10’s and 100’s of thousands to winners. That doesn’t mean you have to enter the huge tournaments or even come in first. Usually 10-15% of the field gets paid, with each winner usually at least doubling their buy in for the lowest pay out. You can also play head-to-head tourneys or other smaller tournaments if you want to have an even better chance of cashing and consistently winning money. – Is It Easy To Deposit and Cash Out? Yes – because FanDuel and DraftKings and Daily Fantasy Sports in general are legal, there’s no issue with payouts. The sites themselves pay out very quickly once you request a withdrawal. DraftKings has instant deposits through debit/credit cards and through PayPal and Dwolla. Please note that for withdrawals, DraftKings first refunds your deposits to the original deposit method, so if you prefer to receive all payouts through a certain service, make sure you deposit using that method. FanDuel has instant deposits from credit/debit cards and PayPal. You can withdraw winnings at any time using PayPal and that is processed within 48 hours. You can also request a check which may take longer since it must be sent out to you.